This pale blue La Finesse porcelain knob with white stripes is a beautiful focal point on a cabinet’s drawer or door. Adding a new knob to an old piece of furniture is an easy and inexpensive way to change its appearance. The knob has a diameter of 4 cm and it is simple to install. Once it is attached, it stands out about 3,08 cm from the surface. 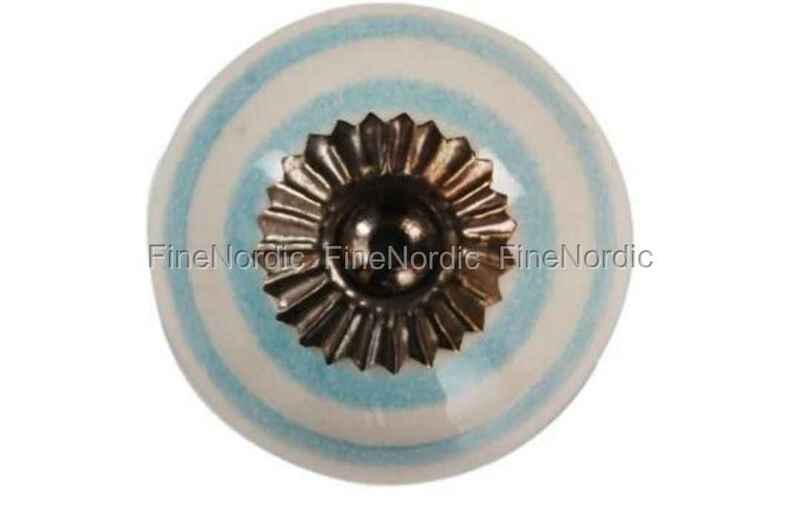 This porcelain knob will look great on a white chest of drawers and also add a little color to it. If you enjoy giving new life to a recycled commode or armoire, then please have a look at the large variety of knobs we offer in our web shop. You just might find the perfect one for your next refurbishing project.